In between a pie bar and a crumb bar, these cherry almond bars have a delicious buttery almond base and are bursting with fresh cherries. One of the best things about summer is all the delicious fruit. I love getting fresh blueberries, bright pink watermelon and juicy peaches. But my favorite fruit season is Cherry Season (capitalization required)! Every year I end up eating cherries till my hands, lips and shirt are covered in red juice and my stomach is screaming at me. But I never stop. They’re my favorite – and to me, cherry season is my delicious, non-stressful, inexpensive Black Friday. Maybe you’re not as obsessed with cherries as I am, but I promise you’ll love these cherry almond bars. 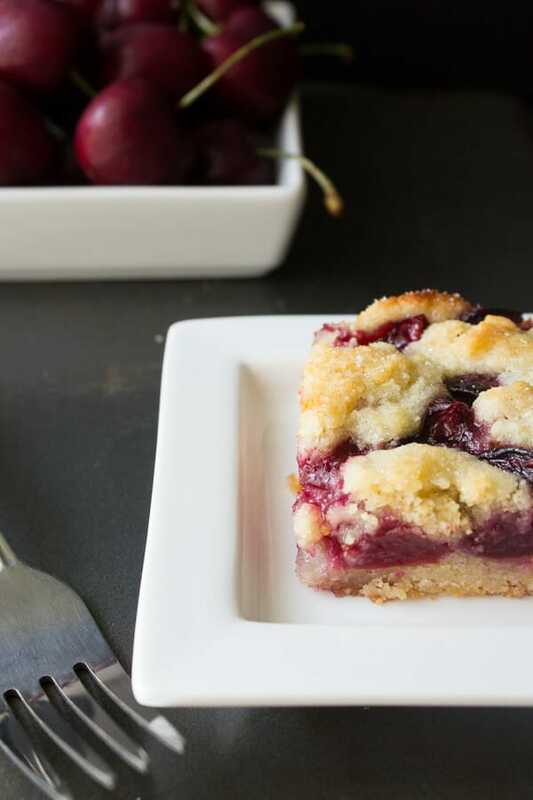 They’re in between a crumb bar and a pie bar with the cherries taking center stage. The almond flavor pairs perfectly and gives the bars a nice little something extra – but the star of this production is the cherries. Now, I know that baking with fresh cherries can be… well… a bit of a pain. The hardest part of this recipe by far is getting the pits out of your cherries. I don’t have a cherry pitter. I’ve heard you can use a pastry tip instead – but I just used a little paring knife and got to work. Your cherries don’t need to look pretty here, so there’s nothing to worry about. Once your cherries are pitted, it’s smooth sailing. Time to put on your favorite tunes and start your kitchen dance party. You’ll use the same batter for your base & topping layers, which makes life pretty fantastic and stress free. 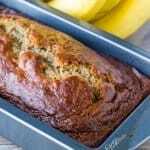 To make the base & topping, simply whisk together the dry ingredients – then cut in the cold butter and egg using a pastry cutter or just your fingers. The mixture will be a bit crumbly. Then you’ll press about 2/3s to 3/4s on the bottom of your pan, followed by your cherry mixture, then crumble the rest on the top. These will need to bake in your oven for 35 to 40 minutes – which is really the only downside of making these bars. You’ll see the top start to slightly brown, and where the cherries are exposed you should see the liquid bubbling. Mine took exactly 40 minutes. These bars would taste delicious with a scoop of vanilla ice cream, but my favorite way to eat them is cold, right out of the fridge! Preheat the oven to 375F degrees. Grease an 8x8 inch square pan. In a medium mixing bowl, whisk together the flour, ground almonds, 1/2 cup sugar, baking powder and salt. In a small bowl whisk together the egg, vanilla and almond extract. Then, using a pastry cutter or fork, blend the cold butter and egg mixture in with your dry ingredients. Press 2/3s to 3/4s of the mixture into the bottom of your prepared pan. Toss your cherries with the granulated sugar, cornstarch and water. Then sprinkle evenly over the base layer, then crumble the remaining dough over the cherries. Optionally, sprinkle additional tablespoon of sugar on top of your bars. Bake in your pre-heated oven for 35-40 minutes. 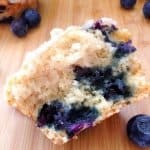 The top crumbs should be just lightly browning. Allow to cool completely, then cut into 9 large squares or 16 bite-sized. Bars are best if stored in the fridge in an airtight container. It’s not quite cherry season, so I was wondering if I might be able to make these with frozen cherries? Has anyone tried that?